Psych Club Presents: Valentine Card Decorating! 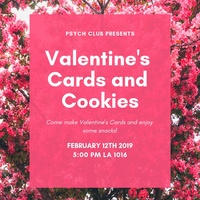 Join Psych Club on February 12th at 5pm in LA 1016 to decorate some Valentine's Day cards! Materials will be supplied. Also enjoy some cookies and other sweet snacks!